Coulommiers : Médéric Charot, 1886. Description : bt, frontis., tp, -27 ; ill.: 1 phot. ; 23 cm. Photograph : oval heliogravure portrait with facsimile signature below. Subject : Medical biography — Charles-Achille-Hector Donon, 1826-1886. Author caption: Dr. A. Corlieu [in-text]. Volunteer surgeon, ambulance corp., Palais-Royal, 1848 Revolution. Librarian, Faculté de Médecine, Paris 1877-1897. Photo caption: Heliog. P. Dujardin. Paris. Fine photogravure portrait of Dr. Dolon whose legacy was printed on the hearts of the Saint-Cyr patients he served. 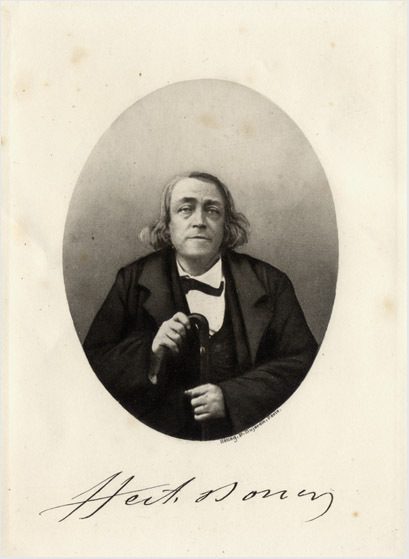 His one contribution to the literature was a monograph on medical logic titled, Du syllogisme dans les sciences médicales (Paris: Rignoux, 1852). Corlieu, on the other hand, was a prominent medical scholar and librarian, distinguished by his writings on the Paris Faculté de Médecine and the author of a great number of ancient and modern medical histories and biographies. He also wrote on historical medical cases including the fistule of King Louis XIV and the deaths of Louis XVII and Charles IX.